So, is she touches him she is not safe anymore? I would guess she’d suffer the same fate as the stone from the previous page and spontaneously burn… That can be assimiled as “not keeping her safe”, can’t it ? I’d love to explain further, but I gotta keep you guys curious! … So how come in Chapter 1 he went to touch her hand with bare skin? What was he after? Or is he just picky? 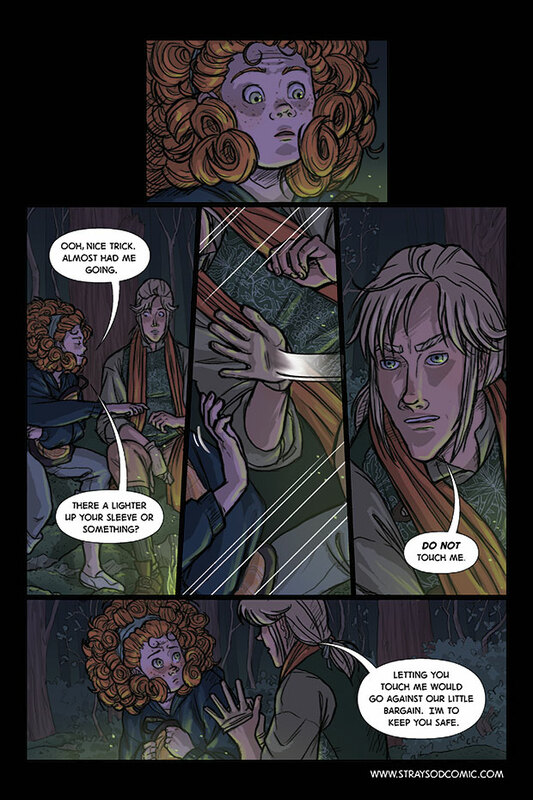 Maybe because they were not in Faeryland, then…? I have to ask…just discovered this comic and I’d been lurking for a while, but this is something I’d been wondering since I saw him. Is he a ganconner, by any chance? Yes he is, and I’m excited you guessed so early! It’s spelled differently in the comic, but it means the same thing.